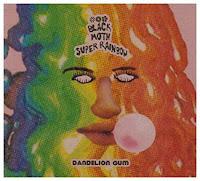 Black Moth Super Rainbow (BMSR) will be of interest to fans of neo psychedelia. They use low tech electronic instruments like the vocoder. BMSR are from Allegheny County, PA. The lead singer who likes to use the vocoder is Thomas "Tobacco" Fec. All the members have strange stage names. This appears to be for privacy reasons and I guess it adds to their mystique. He began experimenting with electronic instruments in the mid 90s. At first he recorded with his brother Ken Fec known as Power Pill Fist. Eventually it became a band called Black Moth Super Rainbow. Other members are keyboard player Maureen Boyle known as The Seven Fields of Aphelion, drummer Donna Kyler known as Iffernaut, guitarist Ryan Manon known as Graveface and bassist Pony Diver. They record on their own label Graveface Records. The 2007 CD Dandelion Gum is probably their best known album to date. Sun Lips was their first video. The notable thing about BMSR is they are making electronic music today with instruments that were used in the 80s. With autotune so common today, who uses a vocoder? That's an example of what BMSR is trying to do. It's not commercial music. They aren't going to top the charts. They don't want to anyway. BMSR last released a full album in 2012. But they have released EPs and Tobacco released a solo album last year. It's experimental music that's not for everyone. Here's the video for Sun Lips by Black Moth Super Rainbow.